The term hammer toe describes three unique contracture deformities of the toes. The deformities differ by the location of contracture in each joint of the toe. 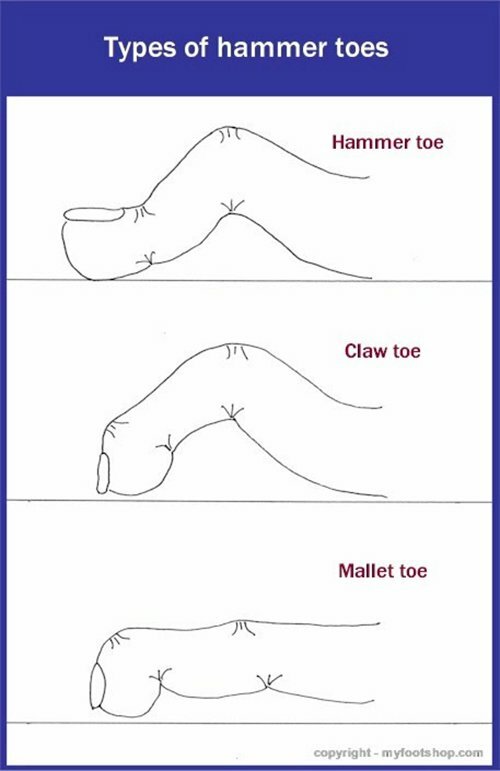 The three deformities include hammer toe, claw toe, and mallet toe. Hammer toes may be flexible or rigid. 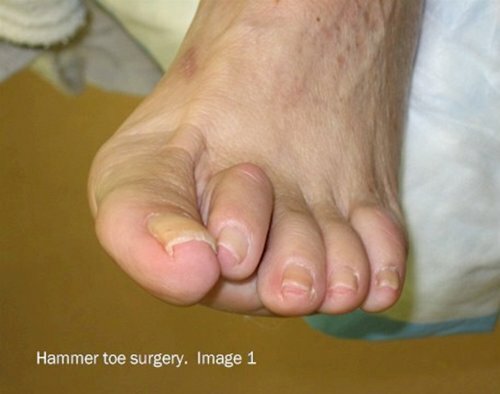 Hammer toes are most common on the lesser toes (2-5) and may affect one or more toes simultaneously. Hallux malleus is the term used to describe a hammer toe of the great toe. Hallux malleus is often found as an isolated foot problem. Hammer toes are found equally in men and women. The onset of hammer toes occurs between the ages of 30 and 80 years. The name hammer toe comes from the way the tip of the toe hits, or hammers, on the floor with each step. The primary deformity seen in a hammer toe is found at the PIPJ (proximal interphalangeal joint) which is the first, or more proximal, of the two joints of the toe. A mallet toe, on the other hand, is a similar deformity but is found in the DIPJ (distal interphalangeal joint.) Lastly, claw toes are a deformity where the entire toe grabs and involves the MPJ (metatarsal phalangeal joint) PIPJ and DIPJ. 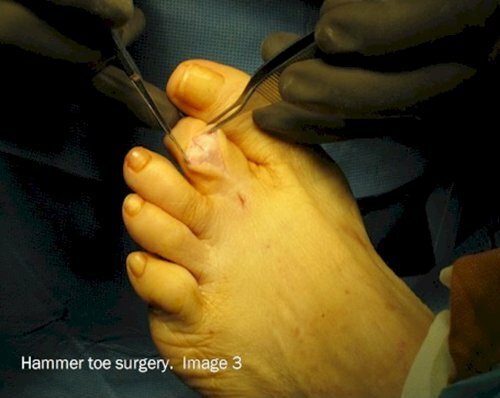 Collectively, these deformities are referred to as hammer toes. 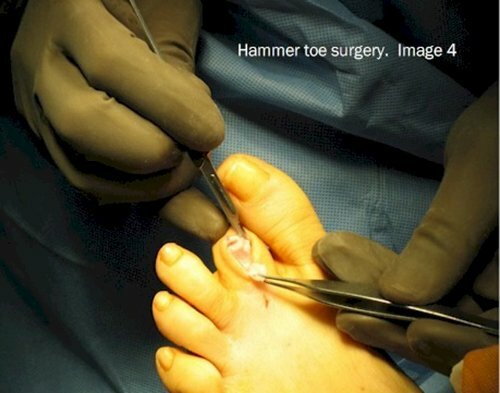 Hammer toes can affect one or all of the toes simultaneously. Hammertoes are caused by two basic biomechanical problems called extensor substitution and flexor stabilization. The extensor tendons are found on the top of the foot and lift the foot, raising the foot toward the shin. There are two types of extensor tendons: long and short. 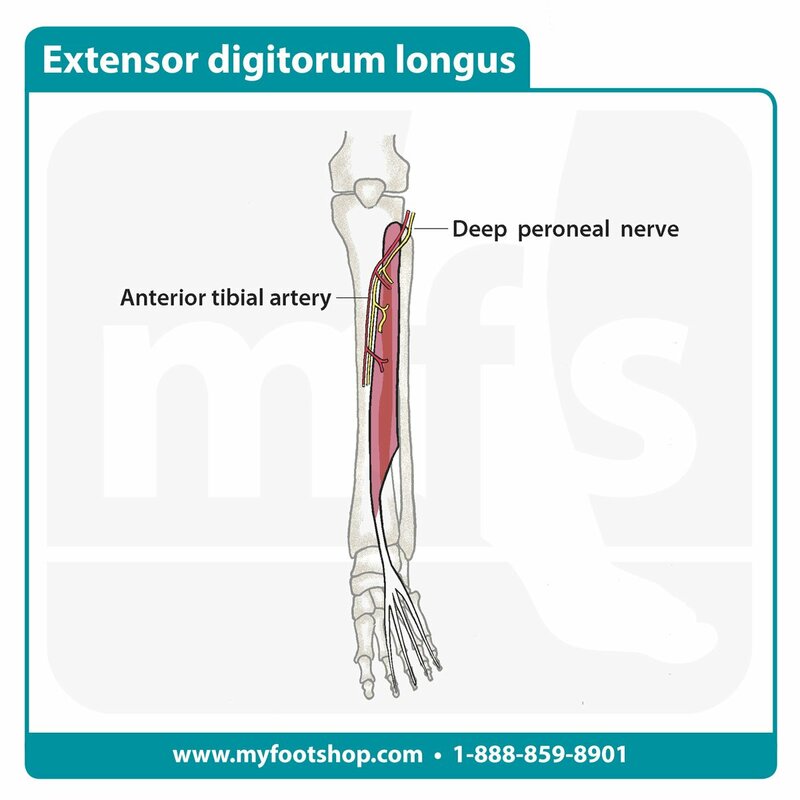 The long extensor tendon, called the extensor digitorum longus (EDL), originates in the anterior leg. The EDL descends the leg crossing the ankle and continues on to the distal tips of the toes. The EDL extends or lifts the toes. In cases of muscular imbalance, the EDL will change its primary function to aid other muscles in maintaining balance. When the calf is particularly tight (see equinus) the EDL will change its primary function to assist the tibialis anterior muscle to dorsiflex the foot at the ankle during the swing phase of gait. As a result of the tight EDL, the toes will form a hammer toe. One of the cardinal signs of extensor substitution is pronounced hammer toes when the heel strikes the floor during gait. The flexor tendons are found on the bottom of the foot. There are two types of flexor tendons: long and short. The long flexor tendons originate in the leg while the short flexor tendons originate in the foot. 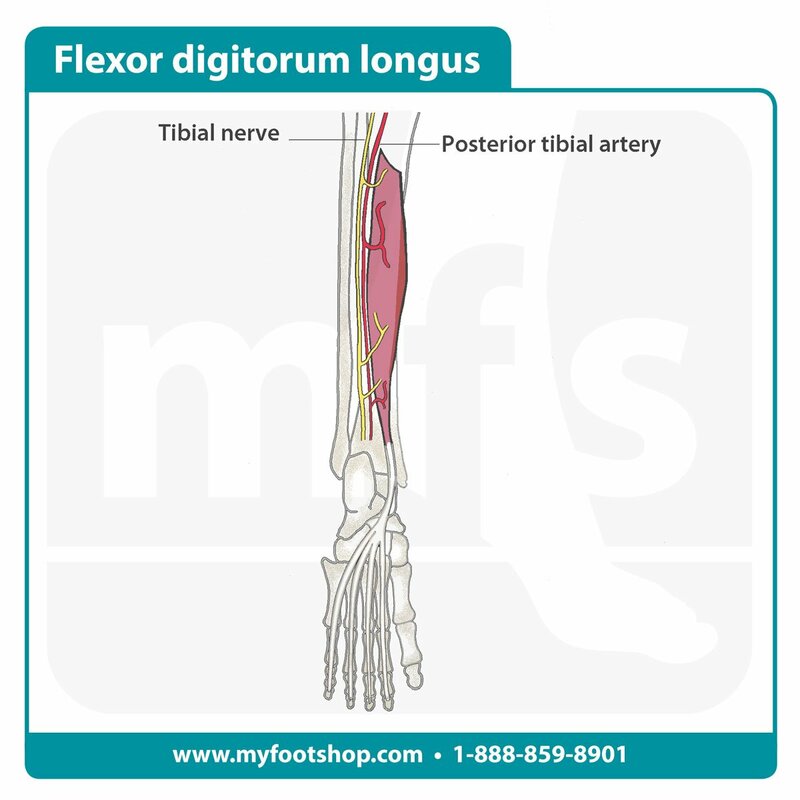 The long flexor tendon to the toes is called the flexor digitorum longus (FDL). The FDL traverses the bottom of the foot to insert into the bottom tips of the toes. When there is an imbalance in the normal function of the foot, the flexor tendons are often called upon to stabilize the foot. Flexor substitution is particularly common in cases of an unstable foot such as a flatfoot (pronated foot.) Flexor substitution acts to make the unstable flatfoot a more rigid lever, pulling from the heel against the toes. The increased pull of the FDL to stabilize the foot will subsequently cause the toes to "hammer." The image to the right is a case of pronounced flexor substitution caused by posterior tibial tendon dysfunction. Treatment of claw toes ranges from simple shoe modifications to sophisticated surgical repair. Logic dictates that our initial attempts at treating hammer toes would include softer and wider shoes. Shoes such as clogs offer a wide toe box that in many instances may be enough of a change to allow pain-free walking. 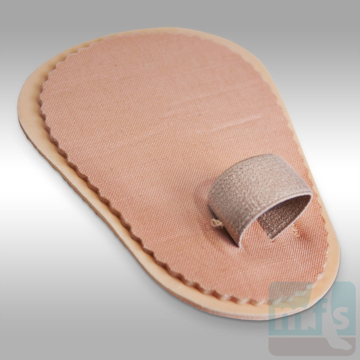 Hammer toe pads are often used to control the motion of the toe to hold it or bind it in place so that it doesn't rub on the shoe. Many variations of pads are available to treat hammer toes. Finding the right hammer toe pad really depends upon the individual toe location and type of hammer toe. Surgical treatment of claw toes varies from simple releases of the extensor tendon (top of the toe) to complex tendon transfers and bone fusions. 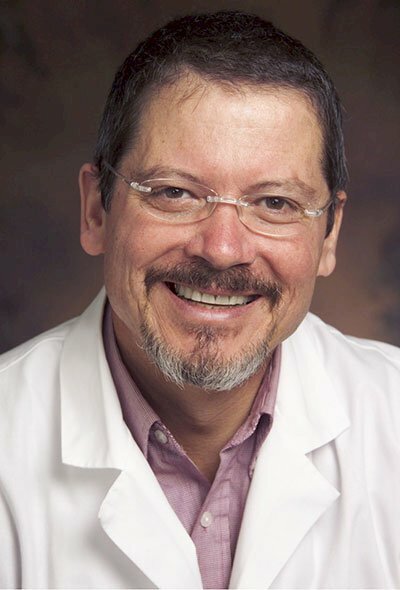 The most commonly used hammer toe procedure is that which was described by Post in 1895 and is referred to today as the Post Arthroplasty or Post Procedure. The Post Procedure involves resecting (removing) the knuckle of the toe at the level of the proximal interphalangeal joint (PIPJ) This joint is the joint closest to the point where the toe attaches to the foot. Typically, the Post Procedure will be performed in conjunction with a tendon release on the top (extensor surface) of the foot. The combination of these two procedures results in a toe that will lie flatter, avoiding direct pressure from the shoe. The Post Procedure may be performed under local or general anesthesia. The procedure is performed in an office setting, surgery center or hospital. Post-operative care includes sutures and bandaging for two weeks. Showers can be resumed once sutures are removed at 2 weeks. Return to shoes varies based on the activity and type of shoe. Most patients can return to a loose fitting shoe (athletic shoe) at 3-4 weeks post-op. 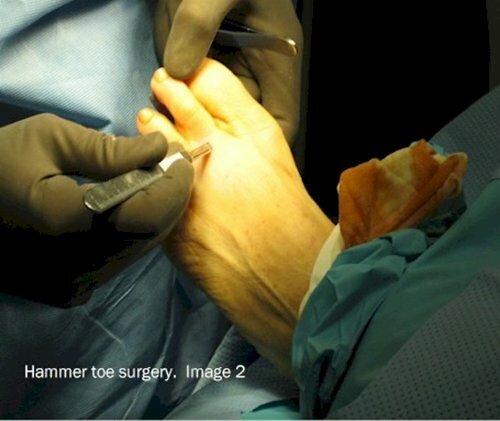 The following images show the surgical correction of a hammer toe using the Post arthroplasty. Modifications of this procedure may include a fusion of the joint, pinning of the toe or digital implant. These photos show dissection at the level of the proximal interphalangeal joint (PIPJ) for correction of a hammer toe. Image 1 shows the pre-operative position of the hammer toe. Image 2 shows a release of the dorsal capsule and extensors tendons with a #15 blade at the level of the metatarsal phalangeal joint. Image 3 shows the long extensor tendon at the level of the PIPJ. In Image 4, the extensor tendon is reflected and the PIPJ ligaments released from the medial and lateral sides of the PIPJ. Image 5 shows resection of the proximal phalangeal head with a pair of bone nippers. In Image 6 we see final closure of the wound. Hammer toes that fail to respond to a reasonable period of conservative care should be evaluated by your podiatrist. Hammer Toes by Myfootshop.com is licensed under a Creative Commons Attribution-NonCommercial 3.0 Unported License.